I recently sat down with Shane Obata, MFin ’17 to discuss how he became a Director of Investments and Portfolio Manager at Middlefield Capital Corporation. Shane is one of the Lazaridis MFin program’s most distinguished and committed alumni who is dedicated to seeing the program thrive. The following is an edited transcript of the interview he gave. I was born and raised in Toronto – the Beaches, specifically. I lived there until I moved to London, ON for university and moved back to Toronto after graduating from Western. What were your favourite subjects in high school? In high school, my favourite subject was actually history. I liked the notion of learning from the past and was particularly interested in the way people from the past carried and presented themselves, it seemed like a more sophisticated time. History is interesting because it leads to evolution and improvement if a society can learn from it and move forward. I actually didn’t study business; I was a kinesiology student at Western. My grandfather was a businessman whom I looked up to, but business didn’t seem like an option for me because I wasn’t particularly good at math in high school. I was, and still am, interested in health and fitness so that’s what I wanted to learn more about. Did you work in between graduating and starting the Lazaridis MFin program? Yes. After I graduated, I spent some time studying and building a foundation of knowledge to take the CSC and the CFA. It took me quite a while to find my first internship in the business; but, from there I worked internships and took part-time jobs until landing my first serious finance job in 2015, one month after starting the Lazaridis MFin program. Why did you choose the Lazaridis MFin program? I looked at McMaster, Queen’s and U of T’ s finance programs because I wanted to take something in the GTA. Since I was still navigating a career pivot, I didn’t have any interest in taking time away from work to go back to school. The Lazaridis MFin program appealed to me because I could work full-time while earning my degree and it’s much more affordable than U of T, which only offered the full-time program. On top of that, Laurier has a very deep network and excellent reputation in finance, especially in Toronto. So, after talking to friends and colleagues in the industry, I decided the Lazaridis MFin program was the best choice. What is it about the finance industry that appeals to you? I really like the markets because they’re dynamic. That keeps things interesting because you don’t know what’s going to happen on any given day. The only constant is change. I also like that history matters in finance and so does psychology, which was my favourite subject in undergrad. You often find that what our emotions tell us to do is actually the complete opposite of what we should do, and that’s especially true in the markets. Also, finance incorporates politics, current affairs and economics to create a very exciting environment. I work for Middlefield Capital Corporation, the investment advisory arm of Middlefield Group, which has $4 billion in AUM and about 70 employees. We offer a selection of financial products such as ETFs, mutual funds and closed-end funds. Most of my day is spent researching and recommending investment ideas to my colleagues. Some of the best skills I learned in the MFin program were in quantitative analysis, which I rely on heavily. Walk me through a typical day at your job. There really is no typical day in a small investment firm; I wear a lot of different hats. Usually, my workday starts at 6:30 AM. There’s plenty to do before the open at 9:30, I read about what other markets have been doing overnight, digesting what happened in Asia and what’s going on in Europe and paying attention to any news stories that have come out that are relevant to the North American markets. After the markets open, I continue doing research on select companies and work on projects that may involve analytics or business development. We also have frequent meetings with the management of companies and with our sell-side partners and their analysts. The best part of my day is facing new challenges. Work will involve some tasks that you want to do and others that you don’t. Either way, I always try to say “yes” whenever possible because that’s how you learn and grow. I would say that in finance, it’s taken for granted that everyone starting out has advanced technical skills and expertise. I get resumes all the time and can tell you that no one is getting through the door without pretty much being an expert in Microsoft Office, especially in Excel. You also want to demonstrate passion for finance. For example, if you are interviewing for a job in asset management then you need to demonstrate that you enjoy keeping up with the news and are able to do quality research. Beyond that, it’s also useful to have additional technical skills like being able to use Bloomberg or Thompson Reuters or even computer programming. These are all tools you can apply to be successful in finance. After mastering the technical side, the most important thing to be able to do is network. I can’t overstate the importance of being personable. You can be a financial ace, but if you’re not someone people want to be around for 12 hours a day, you won’t make it. Make sure you can talk about things that are going on in the world, join clubs, join sports teams and be well-rounded. So much of this industry is built on who you know, that’s why creating and expanding your network is critical. Meet as many people as possible because you never know when you’re going to meet someone who can help you, or better yet, someone you can help. 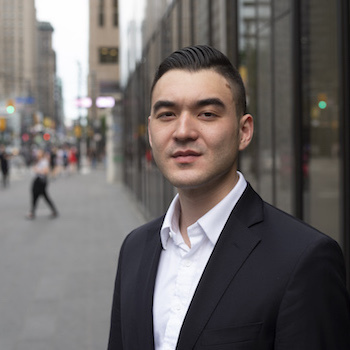 To connect with Shane and other graduates of the Lazaridis MFin program in Toronto, join us for our Annual Laurier Finance Meet-Up on April 30, 2019. To learn more about the Lazaridis MFin program, visit our website.